Marty Pants is back! And in an unexpectedly hairy situation, Marty puts his outlandish deduction skills to the test, and decides this new mystery is leading to monstrous consequences. When Marty finds a ripped page from his sister's diary, his overactive brain becomes convinced that it reveals his true, secret identity. Marty keeps twisting every clue until he comes to the only logical conclusion: he's on a one-way trip to werewolfville! Superhuman speed? Howling? Hairiness? The evidence keeps mounting, and Marty desperately looks for ways to protect his classmates from himself. But is he barking up the wrong tree? 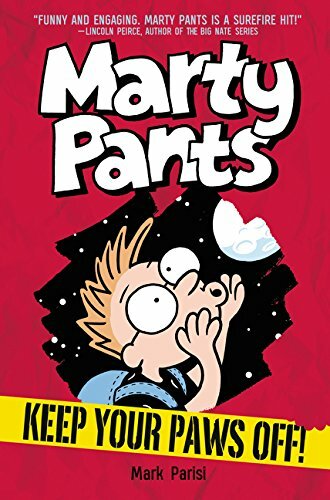 The second book in the Marty Pants series from the award-winning cartoonist behind the “Off the Mark” strip, Mark Parisi, is perfect for fans of Wimpy Kid, Big Nate, Timmy Failure, and laughing a lot. "Marty Pants jumps to wild conclusions again with hysterical results. Parisi's second heavily illustrated, comic strip-dotted tale of art and absurdity is as fun and funny as the first." "A solid choice for young reluctant readers who like hybrid novels."